ARC review. I would like to start by thanking the publisher for the opportunity. Spoiler free review. No spoilers from the Faithful and the Fallen series either. Expected publication: January 11th 2018 in the UK. Of Blood and Bone is a new trilogy taking place roughly 130 years after the last events of Wrath (The Faithful and the Fallen, #4). And things have significantly changed in the Banished Lands. The landscape is definitely different (can’t wait to get my published copy to see the map), peace is tenuous at best and ghastly, troubling things are happening all around the land and even at the heart of the Desolation. The first one couldn’t be helped! The Faithful and the Fallen is without doubt one of the most overwhelming, emotional and satisfying series I’ve read in my life. But despite its narrower scope, a Time of Dread hinted at unexpected alliances and betrayals, gory action and epic battles coming our way in the sequels. While it still can be seen as a battle between Good and Evil, you will encounter a few shady protagonists and institutions and aside from a few exceptions, you will be seriously questioning some key characters’ motives. As for the second, I avoided falling into the trap halfway through the book by taking a break and going back with newfound eagerness and fresh eyes. And I just enjoyed the last half even more. But then, it wasn’t much of a surprise really, as Gwynne has a real talent for concluding his books. And when I started to wonder where he was taking his story, John brought every thread into focus in a most exciting, tense, unexpected and emotional way. Lastly, the difficulty with sequel series is that you need to create new characters and stories that have their own voice and aren’t copies of the old ones, while keeping a coherent link with the latter and sharing a common history and background. 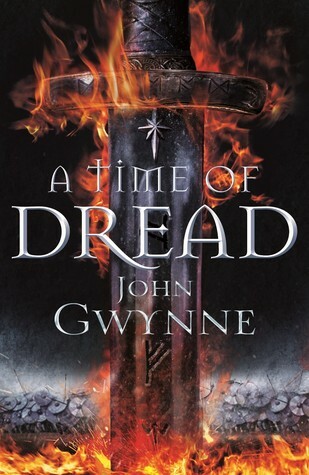 John Gwynne pulled off the challenge brilliantly by creating attaching personalities struggling in a much darker and grimmer world than the one we left at the end of Wrath. The story is told from 4 points of view and despite sharing one or two traits with the old characters, they all felt so real and relatable and had so much room for growth. Every action, every thought or every retort seemed to build a new layer in their personalities. Friendship and family, honor and loyalty are still as central themes as gore, fights and epic battles in John’s books. You will also find familiar elements like the Warrior trials, the Shield Wall, the Sword dance, the giants’ Segul, Wolven… (the mention of these names alone made me tear up inconsolably!) Therefore, the story and plot felt at the same time original and very familiar (coming of age trope, Good vs. Evil, angels and demons, strong family and friendship and human-animal links…) compared to Malice. Which brings me to my most important point: NOSTALGIA! For those of you who’d read and loved tFatF, this book will feel all the more like a precious gift, with a huge sentimental value. Gwynne celebrated his old cast in such a touching, exquisite way. I felt a pang of pain and nostalgia and love every time one of the old crew members was mentioned (this is no spoiler since more than a century has passed and naturally iconic characters died, but although I expected that, I still felt their loss as if they were friends or family). For that reason alone I wholeheartedly recommend to start with the tFatF series. The major events of Wrath are briefly reminded throughout the book. However, if you’re new to Gwynne’s work and want to start with this book, you totally can. Gwynne made an excellent job giving enough background and history to make you understand the context and the world of his new story. I feel like great but also dreadful paths are to be expected in the sequels. The tone of A time of Dread was definitely much darker than the tFatF in my opinion and I wondered if some events and creatures wouldn’t qualify as Grimdark elements. There was also less humor and relief, for this is indeed a time of dread, with nothing except the bittersweet, warm memories and the unbreakable family links to alleviate the darkness. I can’t wait to delve into the next books and see where John’s taking us. Can’t wait to 1. re-read tFatF and 2. see where the story is going from here! !